You will be given a Free reference e-book to read which has 620 pages And the test will be based on that e-book. Who is a Certified Linux Professional? A certified Linux professional is someone who has successfully handled and passed the certification exam primarily designed for all aspiring Linux professionals. It is essential for you to note that the Linux professional certification exam is developed to meet global and professional standards when it comes to certifying professionals in the industry. It was established to adhere to the specific requirements that an IT professional must meet as well as the standards of most of the organizations that often employ the services of these professionals. A Linux professional certification is also beneficial because it works effectively in validating your skills and knowledge especially those that are essential in performing administrative and management tasks designed for Linux platforms. In order for you to easily and confidently take and pass the exam, you have to consider improving your knowledge about the basics of configuring and installing systems, applications and programs primarily based on Linux, managing and maintaining software and file systems, administering printing and processes, configuring web servers and fundamental network services and establishing bash shell scripts. Learning about all these will significantly enhance your understanding about Linux so preparing yourself for the exam is possible. 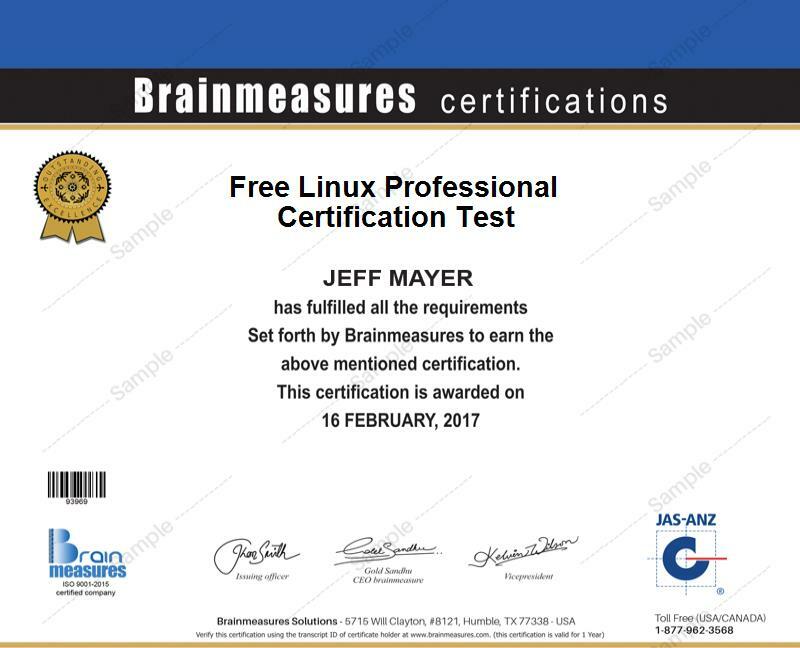 Fortunately, a free Linux professional practice course is now available at Brainmeasures and this increases the level of your awareness about how Linux platforms work. The course can help you in preparing for the Linux professional certification exam through its highly accurate and extensive study guide and practice test offered for free. The free Linux professional certification practice course offered by Brainmeasures is guaranteed to be comprehensively and professionally developed and this guarantees you that you will learn a lot of things from taking up this course from a well-recognized online certification provider. One of the most remarkable features of this course is the free study guide which is mainly composed of the most accurate and updated information about the Linux platform. It can help you in mastering everything about Linux, its main features and capabilities, the major roles and functions that it plays, the specific reasons why it is now highly recommended in the IT industry and the most advanced technologies that you can now use to make Linux even more functional. With the free practice test which also forms an essential part of this practice test, you will easily learn the ins and outs of the actual Linux professional test so passing it will no longer become a problem. How to effectively and correctly administer Linux systems? The free Linux professional certification practice course introduced by Brainmeasures is extremely useful for all those who intend to become certified professionals in running Linux. It targets administrators, consultants, engineers, security professionals, technicians and other individuals and professionals who are in charge of effectively administering and managing Linux platforms and applications. If you are already one of the holders of a Linux professional certification, then you will be on your way towards enjoying bigger salary. With the presence of your certificate, working as a Linux systems administrator is greatly possible and this will entitle you to receive approximately $56,000 to $104,000 every year. Working as a Linux administration consultant is also a great possibility which lets you enjoy up to $155,000 yearly.